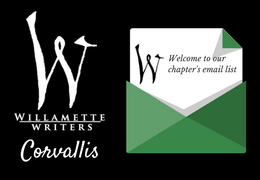 Thank you for your interest in Willamette Writers on the River (WWotR) in Corvallis. If you have a specific inquiry related to the chapter, please contact us privately by emailing us or by completing the form below. Note that it may take us up to a week to get back to you. If you need a quicker response, please contact the Willamette Writers office.